For many of us this weekend will be filled to the brim with soccer goodness as the Euro 2016 championship gets underway in France. 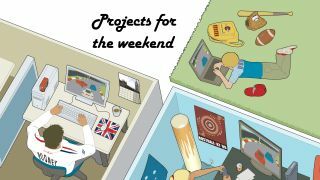 To celebrate we've put together a guide for getting the most out of the footie action, but if you're not too keen on watching over paid men kick a ball around a field, then don't worry as we have plenty of other great projects to get busy with this weekend as well. With the UEFA Euro 2016 championships now in full swing you'll want to make sure you're getting the best experience while the matches are on. In our guide on how to watch UEFA Euro 2016 championship in style, we show you how to watch all the games online and on TV, as well as taking you through some of the best kit to make sure you have a brilliant time – even if the country of your choice gets knocked out. If you're more into e-sports and (like many of us) are hooked on Overwatch, then use this weekend to brush up your skills with our 10 Overwatch tips guaranteed to end in success. Windows 10 is a great operating system, but with Microsoft offering it as a free upgrade some people are worried that there may be hidden 'costs' with the upgrade. In some ways this is true, as there are a number of default settings in Windows 10 that may give Microsoft more access to your details than you're comfortable with. The good news is that these can easily be changed, so make sure you check out our tutorial on how to use Windows 10 privacy settings. Like the idea of owning a Mac, but don't like the prices? You could try building your own – and we show you everything you need to know about building a Hackintosh – including all the legal implications. If the weather is glorious this weekend (fingers crossed), then why not step away from the TV or PC and take some stunning outdoor photos of your garden or the flowers that are now in full bloom. To find out more check out our guide to top tips for taking beautiful flower photos. If you've got a Mac, you could take time this weekend to change its appearance to suit your style and tastes. Head over to our how to change the look of your Mac guide to find out more. If you've got an Android device then you've probably noticed the addition of Google Now, the handy virtual assistant that can make using your smartphone or tablet a lot more convenient. To find out all the cool things you can do with Google Now, head over to our guide on how to use Google Now. Fancy making your very own super hero comic? With our how to use Photoshop to turn images into drawings tutorial we'll show you how you can transform your digital photos into attractive cartoon-like images.